I select the "part ways" upgrade and the only thing that happens is I lose money. Lost interest in Minecraft, only here for Off Topic. EUA YAXK NGBK G RUZ UL ZOSK UT EUAX NGTJY. Very long ago. One scientist. Take pig and bird. Boom boom science explosions. FlyingPig6789 happened. I can't do anything with "Not a Number" soldiers. Heck, it's not even letting me buy anything. Wipe the cookie for rscharts.com. If you need help, search on Google for help relevant to the browser you are using. 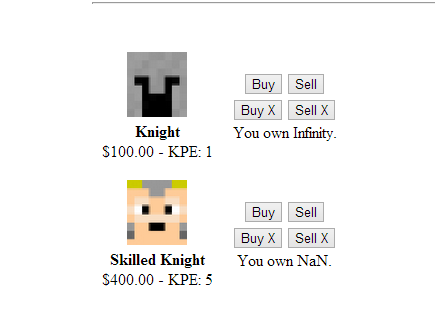 I own NaN skilled knights.I think the chicken and the defense things could use some debugging.And now I own infinity knights. Oh and now my knights are NaN...Also it won't let me buy insurance but I have enough money. Quote me if you want a reply, and please click that little if I helped you out. Paxit - A Nation-Building Forum Roleplay. Join us! Rest in peace, Paxit. Any idea at what point your getting these bugged numbers? Right after each time I fight the chicken. First time I get infinity, second time I get NaN. I should be able to roll out an update soon that will fix this issues and other issues. The update will probably automatically reset the glitched variables, so there shouldn't really be any major progress loss. The chicken army is now NaN.Atleast the chicken can't hurt me now. The chicken army is now NaN. Atleast the chicken can't hurt me now. Same for me. Good thing is I only lost my cheap soldiers. Located the problem causing the messed up values, will have a fix soon. I own NaN skilled knights. I think the chicken and the defense things could use some debugging. And now I own infinity knights. Also it won't let me buy insurance but I have enough money. Haha! You can't escape his vengeance that easy! Maybe you should post the source on GitHub. If he wants help that's a great idea, but if you want to look at the source it's fairly easy. I do however second this, not for ease of viewing the source, but because we can help fix issues. I'd have to clean it up first. I tend to be a sloppy programmer, so I'd have to go back and make things more efficient. Good for you, I lost 6 million to my soldiers. The game definitely has potential. Will be interested in what direction you take it in next. It was most definitely Chikolio's fault. Love this game, I've been stalking the thread since yesterday everytime I checked hoping for an update. Can't wait for more updates and where the game will eventually go! I do have a couple suggestions, one is maybe you should make a way to build a base and housing for your soldiers? What I mean is for every X amount of soldiers you have you would need X amount of lodges or whatever you would call them. Don't feel pressured to add this its just an idea! Another might be to add another tab where you could create and upgrade a fortress you purchased? You could purchase certain upgrades to your castle or base like bigger walls or maybe cannons to protect from Don chico? Again, some ideas, don't feel pressured to add them! I haven't abandoned this forum just yet. Also, maybe a counter that shows you how many dollars per second you're getting?